The unspooled Circle line has been little short of a disaster, at least according to passengers and various Standard commentators. Most blame lowly Edgware Road for the chaos, with reports suggesting that station staff are frequently unsure about which trains depart from which platforms, and are forced to dole out dubious information to irate commuters. Could the above photograph, taken earlier this month, be part of the problem? 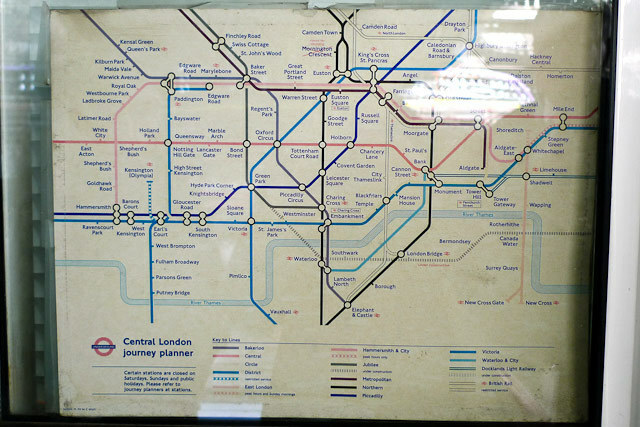 It shows the familiar Underground map, pasted onto the inside of a window in the station staff office on Platform One. Nothing unusual there, but take a closer look: Shoreditch station present and correct, Mornington Crescent "closed for rebuilding" the Jubilee extension represented by a broken line and the legend "Under construction"... yes, it's an out of date map, one shunted in to the branch line of history at least a decade ago, given that Mornington Crescent re-opened in 1998 and the new Jubilee stations were used by the poor saps trundling out to the Dome at the turn of the millennium. As if to compound matters, ten years' worh of exposure to the elements has rendered the yellow Circle line almost invisible. No wonder staff can't help people get to their destination, they probably don't know whither the route runs. See a larger version of the map.